I watched the video and he is concentrating on what happens to the top circuit, not the whole system. The top circuit at t=d/c "sees" the bottom at t=0 and the identical magnetic charges repel. That means both the top and bottom try to move away from each other, not just the top moving up. The bottom circuit at t=d/c "sees" the top circuit at t=0 and the opposite electrical charges attract. That means both the top and bottom try to move towards each other, not just the bottom moving up. The forces between the two circuits alternate between repelling and attracting each other. These forces cancel and result in a net force of zero. I will go through this step by step considering first the bottom circuit. *Not until time step t=d/c does anything happen because it takes time for information to travel after things turn on. At this point the bottom circuit's positive charge pole is attracted to the top circuits negative pole. *bottom circuit t=2*d/c the bottom circuit's south pole is attracted to the top circuit's north pole. *bottom circuit t=3*d/c the bottom circuit is attracted by the top circuits positive pole. *and the pattern repeats for future time steps. *top circuit - t=d/c is repelled by the north pole of the circuit below. *top circuit - t=2*d/c is repelled by the positive charge of the circuit below. *top circuit - t=3*d/c is repelled by the south pole of the circuit below. Thanks for the inquiry as it helps me clarify for everyone who might have a question. The patent doesn't use any equations, and only describes qualitative effects. In addition, it is a patent, which means it is full of claims, most of which it provides no support for. To start with, I need to clarify some things about antennas. The math to support what I am saying can be found in undergrad textbooks. I can provide references if necessary. All accelerating charges produce radiation. This means that anything that has time varying currents radiates. Many antennas such as a single straight wire with oscillating currents will radiate symmetrically. If you bring multiple such antennas near each other and offset the phases just right, it creates a directional beam. This works because of the time delay of the speed of light combined with the offset of their phases makes the radiation in some directions cancel, and other directions add. (Some energy will still go in other directions, but there will be a net asymmetry.) Since photons have momentum, the antenna system will experience a force directed away from the main beam. This will have the efficiency of a photon rocket. Now to get to this claim. I will focus on the example they give with 2 straight wires. These are 2 antennas with offset phases set at a specified distance this is a phased array, so we expect it to accelerate. The discussion they do with the magnetic force has nothing wrong with it, and produces an acceleration just like expected. They ignore the electric field that would be generated from the changing magnetic field. I think this is actually ok, due to the direction the E field ends up in, but they should have at least commented on it. (I don't have the time to work out the E field exactly) If you calculate the value for the force generated, you will find it to just be a (less efficient due to poor overall control of energy direction) photon rocket. After this, they hand wave that using a coil plus a dielectric magically makes it many orders of magnitude more efficient. I saw no supporting evidence for this at all. If designed right, coils instead of straight antennas might be more space efficient, but I really don't think it would work well at all. I don't have time to analyze it though. The dielectric would possibly decrease the spacing necessary between the antennas, but its exact effect is non-trivial. I don't see any way that it would significantly change the system acceleration except that is adds more mass, which reduces the acceleration for the same momentum imparted to the system by the departing photons. As far as your post here, you need to get your terminology straight before you try to explain this. For example "positive charge pole" is not a phrase that would be typically used. You seem to be using charge when referring to magnetic fields, but no known particles have a magnetic charge. Electric charges are not attracted or repelled by magnetic fields. If the charge is moving then it is pushed in a direction normal to both its motion and the magnetic field. Most people don't bother calculating forces from interactions in phased array antennas, because the force values are too small to measure. The interactions between nearby antennas will be modeled for purposes related to induction for circuit design. The description of how the radiative reaction force gets distributed between the antennas in a simple case is neat, but it is not new physics or useful for propulsion. I remember when David created that video. He and I were discussing this phased array idea and he figured out a way to rectify both fields. I commend him for it. However, as with all the phased array's in free space, the distance "d" is wavelength dependent and depends on the speed of light. The "on axis" dipole near-field falls off like ~1/d at best. To minimize d, the frequency must be in the GHz and the dipoles must be very small. To make a long story short, it took me many years to figure all this out. First you find out that moving electrons at that frequency generates a lot of heat even for a small amount of power, and the small end plates have such a tiny capacitance that the air breaks down long before you can reach even 1 millicoulomb of charge. Then you realize you need about a megawatt to demonstrate anything remotely "useful" and it must operate in the MHz range, with MV rated capacitor plates and kA's of current. Next thing you know, you're looking for an aircraft hanger to build it in, because your garage isn't big enough for even the 1st dipole. Regarding the patent I haven't read yet. I glanced at it and from what I've read here, they are using a dielectric. Correct? 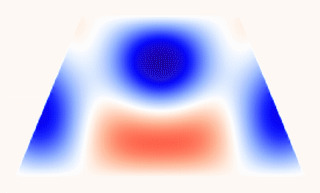 Anytime an asymmetrical EM field is generated, the medium polarizes in the opposite way to oppose the source of the field (except ferromagnetism). So if the asymmetrical field would normally exert a thrust forward, the dielectric medium will oppose that force. That's why David's closing comment about putting a dielectric between them won't work, unless you plan to operate under water, an attached dielectric will work against the thrust. Not to discount resonant materials, but then we're just talking about a LASER really. IMO, none of these ideas bend space-time in any way. I have a little different take on the idea, but it too is impractical for demonstration purposes. See attached. I will focus on the example they give with 2 straight wires. These are 2 antennas with offset phases set at a specified distance this is a phased array, so we expect it to accelerate. (I don't have the time to work out the E field exactly) If you calculate the value for the force generated, you will find it to just be a (less efficient due to poor overall control of energy direction) photon rocket. As a normal phased array antenna should. After this, they hand wave that using a coil plus a dielectric magically makes it many orders of magnitude more efficient. Their assumption would probably be as you decrease the distance between the wires the magnetic force should increase. I assume, they assume the same with the electric force. Using the dielectric shortens the wavelength or slows the speed of light inside for radio frequency which allows them to achieve a shorter distance to get a 1/4 wavelength spacing. The coils could be wound many times for lower frequencies. The dielectric they are considering I believe is Barium Titanate which has a permitivity a few orders of magnitude larger than most. (shorten radio wavelength down to microwave wavelengths). However, I think there are other possible dielectrics considered. I saw no supporting evidence for this at all. If designed right, coils instead of straight antennas might be more space efficient, but I really don't think it would work well at all. I don't have time to analyze it though. The dielectric would possibly decrease the spacing necessary between the antennas, but its exact effect is non-trivial. This is important. I would need to find out the force on the dielectric as warptech suggested also. I don't see any way that it would significantly change the system acceleration except that is adds more mass, which reduces the acceleration for the same momentum imparted to the system by the departing photons. I guess it would have to do with the weight of the dielectric and the dielectric constant and how many orders of magnitude the force could be increased by moving the wires closer together. Also, if a dielectric would experience an opposing force of propulsion. I was referring to the video's illustration of an electric dipole. The force between them decrease as 1/r^3 for far field. This interacts with the other elements electric dipole in the past. So, only interacting electric dipoles, and not the magnetic field interacting with an electric dipole. Technically, magnetic fields are really just velocity dependent electric dipole potentials which only exist because of relativity, but I was only referring to them as North and South poles. Also I'm not exactly addressing a phased array antenna. I will attach a diagram of the difference between the two antenna types. This modified phased array reverses the magnetic interaction of the two antennas. Normally the (magnetic and electric) forces of two phased array antennas work against each other but in a reversed phased array antenna they work together. The number of loops would be increased of course, especially using longer wavelengths. Sorry messed up the png below but I fixed it now. Edit 2: modified to be more symmetric. I remember when David created that video. He and I were discussing this phased array idea and he figured out a way to rectify both fields. I commend him for it. This is so cool. I didn't know you knew him. However, as with all the phased array's in free space, the distance "d" is wavelength dependent and depends on the speed of light. The "on axis" dipole near-field falls off like ~1/d at best. To minimize d, the frequency must be in the GHz and the dipoles must be very small. I could tell you have put a lot of time into it. This may be what gets me unfortunately. I haven't realized a dielectric would behave in this fashion. Thanks for pointing this out. A recient post "Angle wire resonator as reactionless drive" got me thinking of a previous idea I was mulling over, how to use a lower frequency to induce non-symetric propulsion in a special counter wound phased array. With a lower frequency most of the time the forces will be symmetric so no propulsion but for a fraction of a second when current reverses in one wire the time retarded forces will be non-symmetric twice in one cycle. For two parallel wires with the current only slightly out of phase between the wires with wire spacing of 0.0025m or 0.025cm and the speed of light being about 3E8m/s and we are using a frequency of 300MHz or 3E8Hz then c=f*lambda so wavelength is lambda=c/f = 1m. Normally you would want the wires spaced at 1/4lambda to get projection of radiation for a phased array but you can still get some at lower frequencies if the currents are out of phase. Normally, for 0.0025m wire spacing we would want a frequency of 3E10Hz or 3*10^10Hz to be a quarter wavelength apart. Taking the ratio of the wavelengths we get edited an incorrect problem: 2*(sec/cycle)*(ratio of tau) = 3E8/3E10*2*t = 1E-2*2(sec/cycle) the time retarded force is non-symmetric before returning to being symmetric. If we are using a sine wave then the current is only a fraction of what it should be = I_max*sin(pi/2*0.01) = 0.015707317311821*I_max but if we use a square pulse that rises rapidly enough then we could get a max current time retarded non-symmetric force interaction for 0.01 seconds every cycle which could be used for propulsion. On the other hand you have to wind so that the static electric effects work with the magnetic other wise you just got another phased array antenna I am guessing. using square waves might be problematic to achieve resonance and also still requires microwave frequencies and the same problems are encountered as using sine waves at that frequency which may not solve the problem of using lower frequencies. Using sine waves of lower frequency drastically reduces the force or radiation of a phased array. I assume a test of the reverse magnetic phased array remains untested and I have suspicion that a reverse magnetic phased array might provide greater than photon propulsion for near field effects. I will also post an image of one reason I think that a phased array antenna (see image) only gives photon propulsion [even though they operate in near field] because the capacitance effect (charge separation) provides opposing propulsion to the inductive magnetic effects. You have to take into account time delayed information. The idea then is to counteract this in such a way that the inductive magnetic effects work with the charge separation (See second image attached below). Notice also in the bottom image how the apparent current propulsion opposes the apparent charge propulsion but with the counter-winding of the phased array the B-field propulsion works with the charge separation propulsion. The main problem is doing this a short distances using microwaves. Could we use lower frequencies? Possibly as stated above. The reason I suggest using a very thin metal coating outside the dielectric is to enhance the Q or reflective surface of the cavity and build up current, however, it may reduce the near evanescent field that penetrates the cavity. Dielectrics may also possibly exhibit charge separation effects in a Transverse (edited:) electric mode so I am not sure the dielectric method would work for certain. What is important is that there is only a magnetic near field that tunnels through the cavity and the two cavities interact with each other (with current in the base plates) 90 degrees out of phase. Maybe optical frequencies and cavities would be better? Basically you take the straight line phased array antenna image above and eliminate charge separation propulsion and you only have magnetic but you do this with dual cavities that are 90 degrees out of phase. If asked why greater than photon propulsion possibly my reply might be, (light slows down near gravitational wells as if influenced by a dielectric (edited:) or that there is a difference in the relative velocity of non-local space observed non-locally [space reaches light speed at the event horizon so light stops/time stops]. As so I would suspect if such propulsion greater than photon force is possible we would be pushing on the dielectric of free space between the space of the two cavities as if it were like a fluid, and so we might be observing space it self being pushed through the cavities? Anytime an asymmetrical EM field is generated, the medium polarizes in the opposite way to oppose the source of the field (except ferromagnetism). So if the asymmetrical field would normally exert a thrust forward, the dielectric medium will oppose that force. That's why David's closing comment about putting a dielectric between them won't work, unless you plan to operate under water, an attached dielectric will work against the thrust. (edited:) The idea being that the space might behave like the water? Link to the video mentioned is below. I think I may have just had a light bulb come on concerning if this patent will work, but first I need the reader to consider a few of my past posts. I will quote these and in a later post I will address why I think this patent, "patent 8,459,002.pdf" may actually work. The whole point of this essay is that Woodward is claiming that there is no problem with conservation of energy and so no reason to sneak in energy from some hypothetical Grav-Inertial Field. If there is a Grav-Inertial Field that the drive is reacting against then the entire essay is not only just as horribly wrong but entirely moot. And even if there were a Grav-Inertial Field you still have some hard questions about our relative velocity with it. I have been contemplating the nature of a Grav-Inertial field, if it does exist. So far the idea goes is that this Grav-Inertial substance should behave like a super fluid. If you are floating in it and you accelerate it takes time for it to catch up to your velocity and flows through you providing resistance to acceleration. At constant velocity it coasts with you at no resistance to the surrounding fluid that is not coasting with you. This gives you your inertial frame of space time with respect to some one else's. The other property of it is that the Grav-Inertial fluid flows into matter, which suggest why matter might have drag on the Grav-Inertial super fluid, and it accounts for gravity which may be the Grav-Inertial super-fluid flowing into matter. The idea is to use a black hole event horizon as a constraint for the velocity of the Grav-Inertial super-fluid that has reached light speed. Some problems I am still pondering are if space is flowing into matter than where is it going. I might guess it is flowing off of our dimensional plane of existence and into another dimension. Maybe this other dimension is a negative matter dimension that is attracted to space-time flowing out "or Grav-Inertial super-fluid". Maybe this might explain the existence of dark matter in a sense. There may be another parallel universe that is gravitationally attracted to our universe because they share space time super-fluid, but not light. I.e. their stars are sucking in our space time and so appear to be gravitational. However, it may be the other way around. We may be the negative-energy matter and we are the ones increasing in space time. Could this explain the expansion of the universe? I don't know. Pushing against our super-fluid space time bubble that travels with us, like a road, may give thrust but then our "super-fluid space time bubble" that was traveling with us will be exhausted. As a result our matter will experience increased drag from the universal space-time fluid till it accelerates to our velocity. The increased drag may possibly apply mainly to the engine it self and the question becomes if it can provide more propulsion than the drag. Would this instead be an artificial gravity? I almost want to think of it as a jet-ski but I am not sure yet. I found it interesting one of the papers in the link was addressing Woodward, "THE CASE FOR INERTIA AS A VACUUM EFFECT: A REPLY TO WOODWARD AND MAHOOD" by York Dobyns et al. I can't speak for either yet as it would take some looking into but looks interesting. The next quote is from the EM Drive thread and has to do with a paper that was found that indicates for light trapped in a cavity in free fall, that light will accelerate downward in the cavity. I got the image of a beam trapped in a circle (inside the cavity) and the circle of light accelerates down. One would assume the cavity is not in free fall. The paper then addresses when a dielectric is in the cavity that the dielectric drags on the light so that it does not fall as freely as it did before. This may suggest that light is being dragged by the dielectric of free-space in addition to the dielectric in the cavity in my point of view. @Notsosureofit. I thought you may be interested. I am not sure why they don't think of the light falling into a black hole as having real mass also. The light falling in will stop all acceleration and freeze in time effectively forming part of the black hole. Enough light falls into a black hole and it should grow larger, energy having equivalence to mass, and light can push a solar sail. Antimatter matter reactions also make a lot of light, and atomic (or nuclear) bonding energy can increase the mass of an atom? page 3 4th paragraph i think. "However unlike in a vacuum cavity, the gravitational acceleration of the wavepacket is reduced by the medium, that acts as a kind of drag force for the wavepacket of light, as pointed out already in the context of light propagation in transparent moving media ." You can think of the dielectric for free space as having a drag on the light also. This suggest that the dielectric of free space is actually moving with respect to the cavity but the dielectric in the cavity isn't moving. The light is both being dragged by the moving free space and the non-moving dielectric in the cavity. Edit: If gravity could create traveling modes that accelerate by its drag then maybe inducing (accelerating) modes in a cavity could also drag space? A gif of what looked like one of the traveling modes attached below and the link for the rest of the files. Not sure any of them were accelerating. Edit2: Eh? just realized this but maybe in this image you could think of it as ratcheting space time? In conclusion the idea is to slow light down so that it becomes heavy and then accelerate it inducing drag on the "space-time fluid" but also to let it escape so that it doesn't decelerate. The acceleration of the light should induce drag in its heavier (slower) state. So the patent "patent 8,459,002.pdf" you will find attached as my very first post on this thread. I really thought it might work but just recently Edit: was told that a dielectric will experience an opposing thrust to that of the wires which seems to make sense. However considering the paper http://arxiv.org/abs/1512.01130 "The not-so-effective mass of photons in a planar optical cavity". In the paper they indicate that the light is dragging on the dielectric but I would also suggest it is dragging on the free space or visa-versa. So I come to the possible conclusion that maybe light is created in the phased array, inside the barrium titanate, as heavy light and then it accelerates but not quite to the speed of light and in doing so drags space time with it even though it is inside the dielectric. Later the light escapes from the barium titanate or other dielectric to free space accelerating again. The only problem being the direction of the push from the emitted light opposes the drag of space. edit: if space is indeed thrown in the other direction and it can be given a mass then it may be thrust but there will be some drag as it flows through the vehicle. The question is how can we control the drag of matter on space time Still the question is if it could indeed induce a flow of space time that could be measured which would be valuable knowledge. Edit: I suppose there are not guarantees it will drag on space more than I hope it would other than the idea that the magnetic forces are now working with the charge separation forces. Maybe the reverse-magnetic phased array would induce a greater drag on space time then say a normal phased array. The patent also suggest separating the magnetic forces from the static electric in such a way that they work together. If I had to try an experiment, it would be to embed the reverse magnetic phased array into some high index dielectric, like barium titanate, and then set a sensitive clock near by to measure if time ticks differently than it does when the object is turned off or maybe a nearby accerometer, but the clock would be a compounding measurement. i.e. synchronize 2 clocks at the exact same altitude so they tick at the same rate but one is near the object. Then turn on the object and check if they both tick at the same rate over 24 or so hours. "Study of light interaction with gravity impulses and measurements of the speed of gravity impulses"
Which is very interesting because they are using 2 superconducting electrodes and charging it to ridiculous voltages and when they discharge the electrons jump from one electrode to the next and it appears to induce a gravitational wave (or space time fluid impulse) that pushes objects and even effects light. Maybe the superconducting electrons have extra drag on space time and when they accelerate they push the space time fluid along with them? You can also scholar.google.com "Design and First Measurements of a Superconducting Gravity-Impulse-Generator" and there is a researchgate paper that talks about that experiment. More can be found by searching for "gravity impulse". I think it is still in question if the EM drive is inducing reaction less propulsion or if it is just thermal gradients in air current. I haven't followed the developments recently as I have been busy. I didn't think it was necessarily related and is the reason why I continued the separate thread. It would require some experimentation on my part to test some of the ideas in this thread but no guarantees. Some of the differences between phased arrays are that they are open systems where as the EM drive, it is thought it is a closed system, but may be open for unknown reasons. The magnitude of thrust and where it's coming from is the big question. Anyway, before I get way off topic here, has anyone tried building this 'reversed phase array'? and if so are there any posted results? If I don't hear anything I will continue my build, I was just searching around to see if anyone had done it already and ran into this thread. I would just like to give warning that building such an apparatus might be tricky. The distance at which the charge separates in the wire is related to the frequency used. The dimensions of the array would need to be matched to the frequency. One then needs to worry about separating the arrays a quarter wavelength apart. This changes if your using a dielectric making the arrays closer together by a factor in which the speed of light is slowed in the material. (A question for thought. - Is the speed of the electric field from charge separation different from the magnetic field in the material? Optimally this should not be different - is it?) Maximizing the effect means making a structure of exactly spaced arrays, how does one do this? Does it exceed photon propulsion. Using the estimated output radiation of a laser (this would be worse if its just radiation propulsion) one can estimate the propulsion from ejected photons. The question being does it exceed photon propulsion? To do this means one should have an apparatus capable of measuring thrust from the photon level to larger. If one expects the thrust to be larger than photon propulsion then one can build an apparatus to measure that, but it might be nice to have a more sensitive device, though likely impractical. If you take these guys seriously they claim it produces forces on the level of DC magnets which goes way beyond photon propulsion. Not sure how seriously I can take that. Then again I don't know that their specific design has ever been tested in which the force from charge separation is constructively working in the same direction as the propulsion from change in the magnetic field which is unlike a standard phased array. In a standard phased array these forces oppose each other. Have you calculated how much force you would be able to generate for a given input power? Since there are more efficient ways to generate a well directed high power beam of photons, and the existence of radiation pressure has been measured multiple different ways, what do you hope to accomplish with your experiment? I will admit, tuning this is going to be the tricky part, have a couple of oscillator designs that I am considering. My background is Electrical Engineering and have some Ham radio background as well. Currently under employed though so I may just have too much time on my hands. I will be using an air gap between elements at first, so as to leave room to change the distance between elements. I have some reason to believe that shortening the distance between elements may improve the coupling between them, offsetting the losses from not spacing at a quarter wavelength. Measuring the force produced is going to be my second issue if they are very small. (I'm pretty sure they will be really small) I've done some reading up on torsion balances, but I don't think I can construct one of these in my appartment that will not be susceptible to other things like random breezes. Probably will have to talk to someone at a University at that point if it gets that far along. Anyway, I thought someone should test this kind of concept. I also considered the possibility that they develop a standing wave that seems to travel faster than light but can't quite seem to justify that. There is also the possibility that some how virtual particles are responsible for near field ftl behavior. Either way if the signal is FTL it just means to get the quarter phase delay you have to slightly increase distance to get the light speed limit again. Not 100% sure but it may be like a negative index dielectric. If the signal is FTL I would just use an oscilloscope with two cables of equal length and measure the distance when the two circuits drop out of phase 1/4 wavelength. On second thought, here is what happens in a phased array. One circuit has to do positive work in the other circuit has to do negative work. this means that one circuit sees the electric field from the other circuit and it flows with it. The other circuit number two sees the electric field from the other circuit but has to work against it. I think what is happening is that when they measure the near field of the other circuit there is increased coupling as you earlier suggested. both circuits want to work with each other's light-speed delayed electric fields and in the process develop a standing wave which appears to be FTL but just represents the standing energy between them. the simple way to do this then would be to space the circuits 1/4 wavelength assuming that the signal between them travels at the speed of light. in order to keep them at 1/4 of phase relation both circuits require an applied voltage. 1 circuit requires More voltage than the other to maintain the quarter phase relationship. Edited: I think you just drive one circuit at a voltage then adjust the phase/amplitude of the voltage on the other circuit till its current is out of phase 90 degrees with the other. This is assuming that the near field isn't FTL and that what people are describing as an FTL field is actually standing energy between two circuits. a word of warning is that I think it's inherent in a phased array to have the spacing a quarter wavelength at minimum. Shortening the distance between them causes the time delay between the elements to require an increase in frequency in order to have the proper electric fields if they travel at the speed of light. Increasing the distance isn't a problem if done in 1/4 lambda. The only way I know to decrease the distance to less than a quarter wavelength is to use the dielectrics. This is also exactly what is suggested in the patent. WarpTech also suggested to me that the dielectric should experience a propulsion effect in the opposite direction as the phased arrays which may negate the benefit from using dielectrics. On the other hand this is a dielectric medium in a standard phased array. I don't think this would be your standard phased array. It is all described by Maxwell's equations. They conserve momentum, so only fields that make it to the far field can carry away momentum from your device. In the near field you can find all kinds of forces between different antenna elements pushing and pulling on each other. After you add up the net force on all of the elements, the only leftover contribution will be the radiation reaction force from emitting photons. And radiation pressure has not only been measured in the far-field. Pioneer experienced acceleration due to emitting thermal photons (in the RF and infrared). 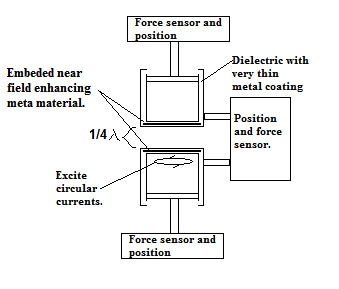 That force was measured based on the resulting acceleration and matched the expected power dissipation once they used a detailed enough thermal model. That measurement was not based on "far field."